Sigma Offshore, the international FPSO turret mooring and marine engineering services company, has secured a contract for a key project which forms part of a multi-billion pound development in the Indian Ocean. Aberdeen-based Sigma Offshore is to provide Bumi Armada with engineering support for a £40m-plus ($62.2m) turret mooring system for a floating, production, storage and offloading (FPSO) vessel in the Cluster-7 field in India. Bumi Armada’s 50:50 joint-venture with Shapoorji Pallonji and Company Limited (SPCL) of India has been awarded a charter contract potentially worth £707m (US$1.1bn) to provide a FPSO vessel for India’s Oil and Natural Gas Corporation Limited’s (ONGC) Cluster-7 field. The FPSO will be operated by SP Armada, the joint venture (JV) set up by Bumi Armada and SPCL. The FPSO will be owned and operated by SP Armada in the ONGC C-7 field located approximately 210km (130 miles) off the western coast of Mumbai, India. The FPSO is due to be delivered in November, 2014. Sigma also provided turret engineering in support of Bumi Armada for the FPSO Armada Sterling supplied for the D1 field in 2012 and which is now producing. While the value of the Sigma contract is not being disclosed, the project is a part lump sum and part variable agreement. Sigma Offshore is an independent provider of marine-related engineering project solutions to the offshore oil and gas industry. Headquartered in Aberdeen, the business also has operations in Singapore, Houston and London. 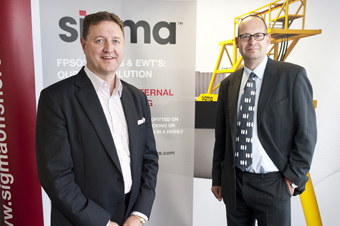 As well as its mooring and riser solutions, Sigma Offshore delivers extended well testing systems, floating production export system solutions, subsea architecture design, deepwater subsea solutions, consultancy services and project management.